The Romanian Film Festival in London |RADU JUDE | Romanian Film Festival | Aferim! 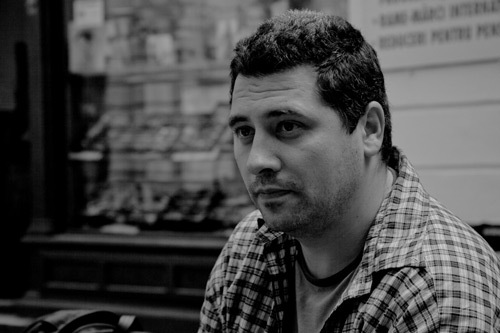 Radu Jude (1977) graduated from the filmmaking Department of Media University in 2003. He worked as an assistant director. He directed a series of short films, among which The Tube with a Hat (2006) (winner of more than 50 international prizes in Sundance, San Francisco, Los Angeles, Uppsala etc.) and Alexandra (2007) (selected in Clermont-Ferrand, awarded in Oberhausen). His debut feature film, The Happiest Girl in the World (2009), (winner of NHK/Filmmaker Award in Sundance and Hubert Bals grant), was awarded the CICAE prize in Berlinale Forum 2009. It was selected in more than 50 film festivals among which were Toronto, New Directors/New Films - NY, Thessaloniki, Sarajevo and London. The film was released in cinemas in France, UK, Austria and Spain. In 2011, he directed and produced the independent feature A Film for Friends. Everybody in Our Family (2012), his second feature film which premiered in Berlinale-Forum, received the Heart of Sarajevo Film Festival Award, Le Bayard d’Or for Best Film and Best Actor at Namur IFF, CinEast IFF Grand Prix, was selected in more than 30 film festivals around the world, and was released in cinemas in France, Holland and Hungary. His two recent short films Shadow of a Cloud (2013) and It Can Pass through the Wall (2014) were selected in Cannes - Quinzaine des Realisateurs section. The latest was awarded with a Special Mention. World premiered in the 65th Berlinale Competition, Aferim! (2015) is Radu Jude’s third feature. He is currently in pre-production with the feature film Scarred Hearts, an adaptation of Max Blecher’s novel.